Twilight Fixation has posted a picture from ladymanson of an Edward Action Hero! What do you think? Would you buy an Edward action figure? 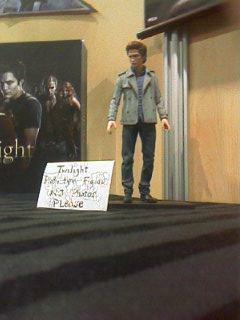 If not, what action figure from Twilight would you buy? Sound off in the comments! OMEOMEOME! Thats sooooo awesome! Im going to buy everyone that comes out!! I WILL DEFINETELY BUY ONE!!!!! wow ok, now thats going WAY to far! ok fo kids tho. ome! Ome! Yes I also would buy other ones to!!!!!!!!! Eeeeeeeeekkkkkkkkkkkk!!!!!!!!!!!!!!!!!! YES!! im going to buy 2 ! cant wait for it to come out im so gonna buy it! Heck yeah I am so going to buy one! Even though it is kind of silly and childish what twilighter doesn’t want their own Edward?! OH MY GOD I AM TOTALLY BUYING ONE!!!!!!!!!!! I hate Barbies and dolls and stuff like that, but I NEED an Edward doll!!!!!!!!!!!! It really looks like Robert, too. OMG I AM SOO GONNA BUY ONE! MAKE THE ENTIRE CULLEN COVEN ! AND BELLA TOO!!! I WOULD BUY ALL OF THEM IF THEY WERE IN STORES! PLEASE MAKE THEM AVAILABLE PLEASE! I LOVE EDWARD! hm. that depends on what it’s gonna look like up close. I just can’t spend like 30 bucks, on an ugly Edward Cullen. >.> that would be so yuck. Ooh, I agree! I guess if he did look really awful I wouldn’t buy it. It would be… wrong. It’s not like for example Lord of the Rings where the actor and the character he plays (Take Orlando Bloom and Legolas) look a lot like each other, at least there are several changes in ears, hair, costume + weapons etc. Robert looks a lot like his character, so it must be a little odd having a doll that looks like him so much in every girls home. I suppose it is quite typical Hollywood, they can make a lot of money on things like that. I’m a little turned off by the action hero doll thing. I feel like it’s really going to cheese up the Twilight thing. I don’t want the series to be over-exposed and commercialized to the point where people don’t love the series anymore for it’s simplicity and the love between Bella and Edward but rather because they’ve made Edward into some super hot, action, vampire hero. Edward doesn’t try to be hero, he just wants to be as normal as he can possibly be with what he’s been given. Granted, I’d love to own an Edward but I’d much rather fantasize about the possibilities than to own some doll. i agree with cynthia on this. first cards then this? way to really cheese it up, idiots. It’s probably weird for Rob, though. Seeing as I collect action figures and I love me some Edward, this product is perfect for me! I would buy all the Cullens!!! Okay at first I was like…creepy. But hey, I would totally buy all of them and like make my own little fanasy world with them. Oh wait, Twilight is fantasy…I hate when I have to remind myself of that. dude, haha, duuuuude…what the heck is this? Hell I would buy the whole set! Thats awsome! OMg, that’s so hilarious! I laughed so hard!!! i would totally buy an edward action figure!!! who wouldnt!!! OMG! I WANT ONE SO BAD! I am totally buying one of those! Its so adorable! xD oh! i with they would make an Edward bobble-head too! :P! LOL i love it! its so cute! ok, so its kida weird but YES i would buy one!!!! im sooooooooooooooooo going to buy it no matter what! If they sell it.. I will buy it! PLEASE SELL IT! Log in | 57 queries. 1.111 seconds.